Preheat the oven to 180C (gas mark 4) and put the chlorine free baking cups in the muffin tin. Melt the coconut oil on low heat. Put the coconut sugar in a mixing bowl, add the melted coconut oil and mix well. One by one add the eggs, and add 4 tbsp of the maple syrup. Add the mashed bananas and mix well. Sieve the gluten free self-raising flour, the baking powder and the salt and add to the banana/coconut mixture. Fold together using a spoon until the mixture is even. Divide the cake mixture over the cupcakes and bake in the oven for around 20 - 25 minutes until browned and ready. Find a bowl which fits a slightly smaller pan. Put water in the pan and put the bowl over it, the bowl should touch the water but not the bottom of the pan. Add the broken dairy free chocolate to the bowl and put the pan + bowl on the hob. Heat until the chocolate has melted. This method is called au bain marie. When the chocolate has melted, peel the avocado and remove the stone. Add the avocado flesh to the chocolate, together with 3 tbsp of the maple syrup. Blend to a smooth paste using a hand blender. Leave to cool and set a little for around 15 minutes before decorating the cupcakes. 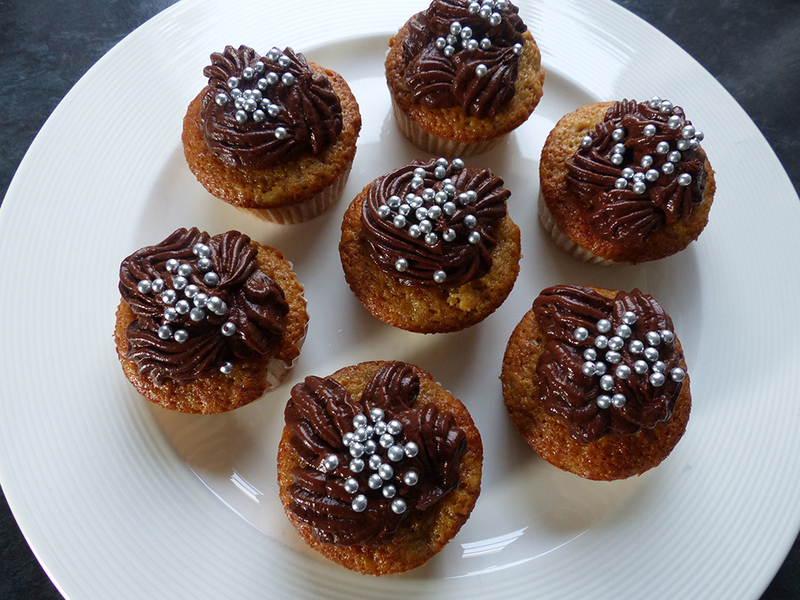 You can also decorate with silver sugar sprinkles, but check the ingredients for gluten and dairy!